Sam (Anders Danielsen Lee) is an Parisian independent musician. He goes to his ex-girlfriend’s house to collect a box of cassette tapes, only to find she is holding a party. Harassed by her new lover and struggles to find the box he came for, he falls asleep in a study armchair. When he wakes it is morning, and he has slept through the entire zombie apocalypse. The zombie film has come a long way over the decades, including a particularly enthused series of treatment over the past decade and a half. They have been sped up in 28 Days Later and its sequel, pulped into science fiction tropes by the Resident Evil franchise of videogame adaptations, they have been remade (Dawn of the Dead), presented as comedy (Shaun of the Dead, Warm Bodies), rendered as blockbusters (World War Z), and serialised at length (The Walking Dead). One would be forgiven for thinking there is little left for the zombie genre to do. 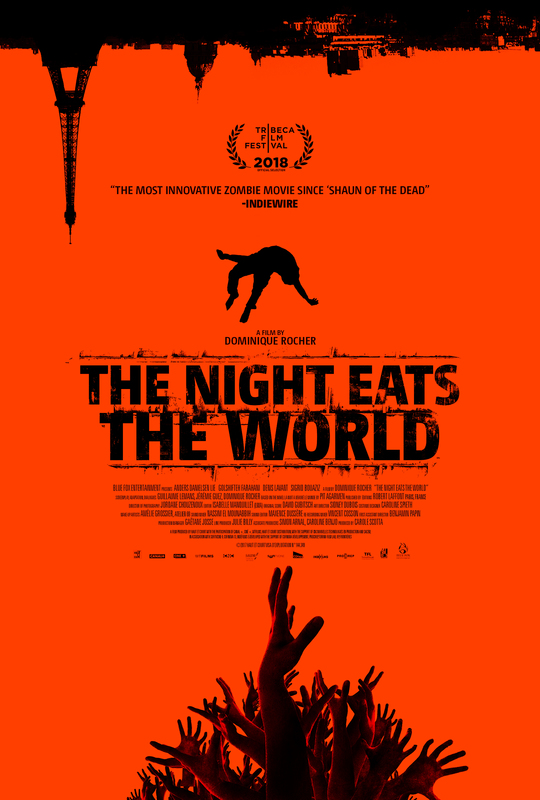 This is where The Night Eats the World steps in as a great new addition to the pantheon of zombie movies. It presents a new take on the old tropes and stereotypes. The audience is denied to opportunity to see Paris fall to the zombie outbreak; within five minutes of the film starting it has already happened. The typical zombie narrative then goes on to have the protagonist look for other survivors – but what if the protagonist simply stayed where they were? Sam does not have anybody to go and save, and stepping onto the zombie-ridden streets looks like suicide, so he simply collects up tools and supplies from the neighbouring apartments, barricades up his new home, and waits to outlast the crisis. It is not getting chased by zombies that provides the horror of The Night Eats the World – although Sam does from time to time get chased. Nor is it the tension of encountering other survivors, because that happens as well. The true horror of the film is the loneliness: everybody around him is dead and attempting to find and eat him. Sam waits fruitlessly for rescue from the authorities, but no rescue seems to be coming. Then there are the zombies themselves. They don’t moan in the traditional style. Instead they are disturbingly silent, with the only sound coming from the cracks of their bones as the jerkily move around and the chattering of teeth when they sense a living human nearby. They track their prey by sound. It is a great generator for tension: Sam is trapped inside a tense, lethal and disturbingly silent nightmare. There are two versions of the film out in the market. With so little dialogue, director Dominique Rocher simultaneously shot the film in French and in English. It is understandably the French version playing at this year’s French Film Festival and the version reviewed here. Anders Danielsen Lee is an effective lead. He is not grizzled and resolved like a typical zombie survivor. He is prone to impulsive behaviour and oftentimes naive stupidity. As an actor he has a tremendous challenge, since most acting is an act of re-acting, and for the bulk of the film he has no one to bounce off against. He does a superb job. Also oddly captivating is “Alfred” (Denis Lavant), a zombie that Sam captures inside an elevator early in the film that he comes to treat as a weird sort of undead equivalent to Tom Hanks’ volleyball in Cast Away (2000). The film is inventively shot and paced – some viewers are going to find it too slow, but I strongly feel the pace is perfectly pitched to the horror story being told, one based on Pit Agarmen’s novel. As director, Dominique Rocher should be applauded for wringing a fresh and innovative take on such a well-worn genre. This is an intelligent and uncompromising new direction for zombies, and a cut above the traditional horror film of this kind. The Night Eats the World is touring Australia as part of the Alliance Française French Film Festival 2019. Click here for more information on this and other French language films screening this year.